The Beauty Scoop: Dermalogica Rapid Reveal Peel - What Is It & How Does It Work? Dermalogica Rapid Reveal Peel - What Is It & How Does It Work? If you are like me and you hear the word "Peel" in regards to skin care, treatments, procedures, etc. and you automatically think of all of the post procedure photos of people with red, peeling skin and it usually looks really painful. So you think, "I really want my skin to look refreshed, younger and rejuvenated, but that looks like it hurts, so is it worth it?" What I can tell you is that yes, the chemical peels that result in all that redness, peeling and irritation are effective and can produce incredible results, but the truth is, you don't necessarily have to undergo all of that to have great results. It's true! Though the word "peel" makes most people think their skin should peel off, there are peels on the market that don't actually make you peel? Weird, right? Well then why call it a "peel"? I don't actually have an answer for that, but I CAN tell you about a new peel-less peel that works fabulously without the pain, peeling and irritation AND it can be done at home! 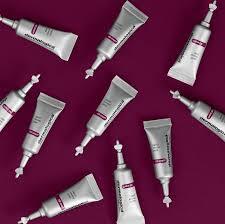 The product is Dermalogica Rapid Reveal Peel. How does it work? This maximum-strength exfoliant delivers powerful results with no downtime. It is composed of a unique complex of phytoactive AHA extracts, Lactic Acid and fermented plant enzymes helps reveal new, firmer skin, reducing the appearance of fine lines and wrinkles by removing dulling surface debris without causing dehydration. In additoin, a Pumpkin Fruit Enzyme and Rice Bran Extract help even skin tone by resurfacing the skin and accelerating cell turnover while smoothing Australian Caviar Lime Extract brightens skin for a more radiant complexion. Sounds pretty great, right? I can attest to that. I have been very please with the results of this peel. Dermalogica recommends a kick-start phase for users looking to achieve accelerated results. Start your Rapid Reveal Peel regimen by using one tube every day for 3 days. After the third day, transition to using one Rapid Reveal Peel tube every week. I chose the accelerated kick-start and have been very impressed. So if you are interested in a chemical peel, but too afraid to dive deep into the more intense peels, then this product is for YOU! Give it a try and you will notice results after the first use! Rapid Reveal Peel comes in a 10-pack (0.1 US FL OZ / 3 ml per peel), complete with travel bag and suction cup for increased visibility and ease of use. Get yours TODAY and get fabulous skin for all of your Holiday plans! technology and library center This cozy yet progressive college will suit the needs of many of today’s 21st-century students.